Gold prices have far outpaced gains in silver so far this year, but silver will emerge as the winner for the second year in a row. With a per-ounce price of $17.41 for silver futures as of Friday, analysts say the white metal is poised for a big climb, particularly as the gold-to-silver ratio stands well above historical averages. “Silver is definitely undervalued compared to gold and as a stand-alone investment. I consider it likely to be the most undervalued asset in the general investment markets,” says Paul Mladjenovic, author of Precious Metals Investing For Dummies. The best barometer of its potential gains comes from its value relative to gold. The long-term average gold-to-silver ratio runs around 15 to 1, while the modern average going back a century is roughly 40 to 1, says Mark O’Byrne, research director at precious-metals storage provider GoldCore. The ratio, which reflects how many ounces of silver bullion it takes to equal the value of one ounce of gold, stood at a whopping 75 to 1 on Friday. 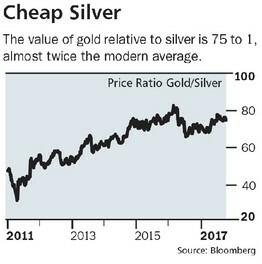 That steep ratio suggests “it’s a good time to buy silver bullion,” says O’Byrne. He explains that the “huge amount of silver used up in industrial applications” suggests the ratio should fall over the long term: “It’s likely that the gold/silver ratio will gradually return to below the 100-year average of 40 to 1.” At the current gold price, that would put silver at nearly $32 an ounce, O’Byrne says. So far this year, however, prices of gold futures have risen nearly 12%, while silver has gained roughly 6%. Last year, silver’s climb of about 16% outpaced gold’s rise of almost 9%. “Silver isn’t keeping pace with gold because the market perception is that gold is a safer play, while the market perceives silver’s role as exposed to economic weakness. But as inflation heats up, more of the public will realize silver’s second role as a store of value and inflation hedge,” says Mladjenovic. THE DOLLAR, AS REPRESENTED by the Intercontinental Exchange’s U.S. Dollar Index (ticker: DXY), has fallen 8.8% this year because of “underlying skepticism” about the Federal Reserve’s ability to keep raising rates, says Lundin. “Even the Fed admits a new-normal rate environment would mean a federal-funds rate of around 2.5%. Balance that against its goal of 2% inflation, and you see they [the Fed] want an ultralow real-rate environment that would be bullish for gold and bearish for the dollar,” he adds. Traders in the fed-futures market still overwhelmingly expect a quarter-percentage-point interest-rate hike at the central bank’s December meeting. If or when that happens, silver will post the bigger gain. GoldCore’s O’Byrne expects gold to finish the year above $1,300 an ounce, for a gain of roughly 13% in 2017. Silver, meanwhile, is set to test $20 an ounce by the end of this year, and close above $19—representing a “healthy” 20% gain for the year.